On this visit to Orphans of the Storm®, volunteers were there to help decorate the grounds for the holiday season. Lights were strung on the trees, ornaments were hung along the walkway to the front office, and cheer was in the air! The festive spirit was contagious, and all the dogs I spent time with were happy to be out and about, watching the decorating. 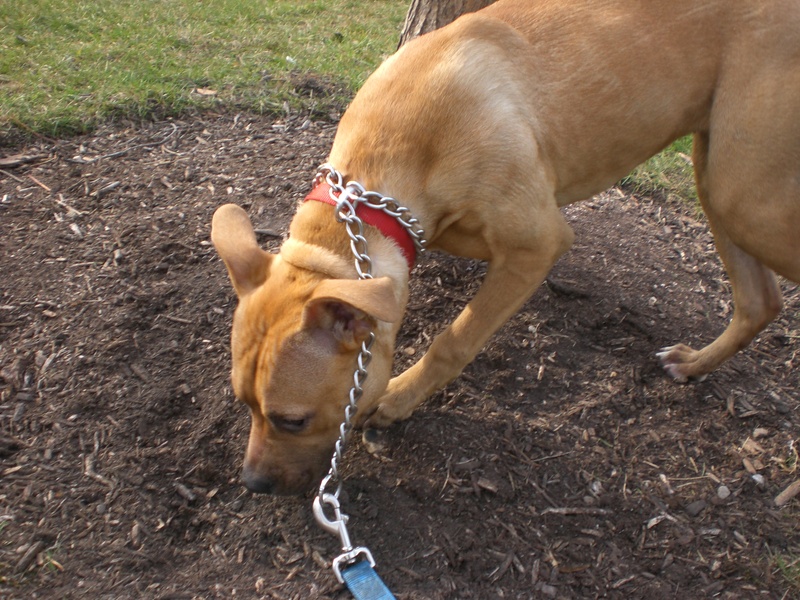 Mollie the Labrador Retriever/Pit Bull Terrier puppy is less than a year old, and she is absolutely adorable. She’s currently Andy‘s kennelmate, and all she wanted to do was play with him. She would pounce on him, playfully put one of her paws on his head, and chase after him. Andy was very good-natured about it. Mollie is just being a cute puppy. Mollie loves getting attention from people, too. Whenever I started to scratch her back, she would lean all her weight against me and wiggle with happiness. Right before we started to walk back to her kennel, she rolled over onto her back and wagged her tail while I gave her a belly rub. She looks especially cute when she abruptly sits down (I told her “Good sit!” each time she did that–maybe it will stick for her future training!). 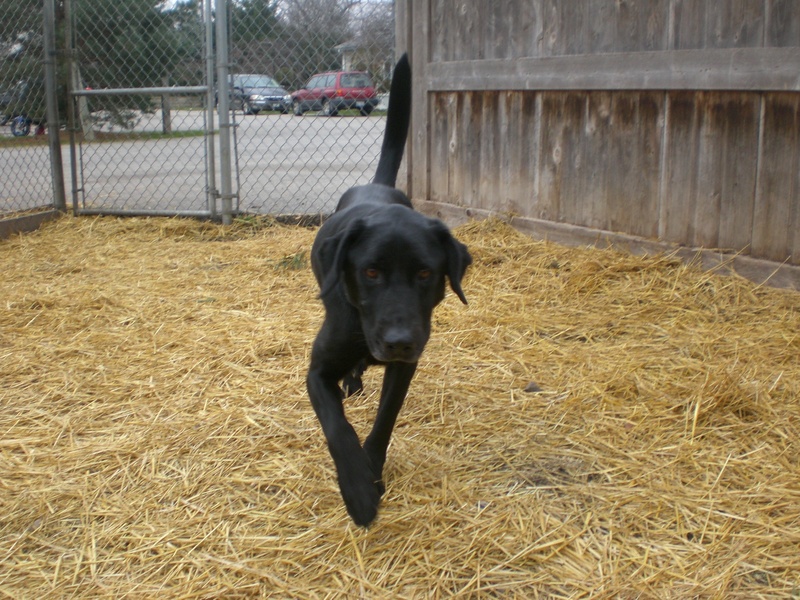 If you’re looking to add a lovable puppy to your home, come meet Mollie! 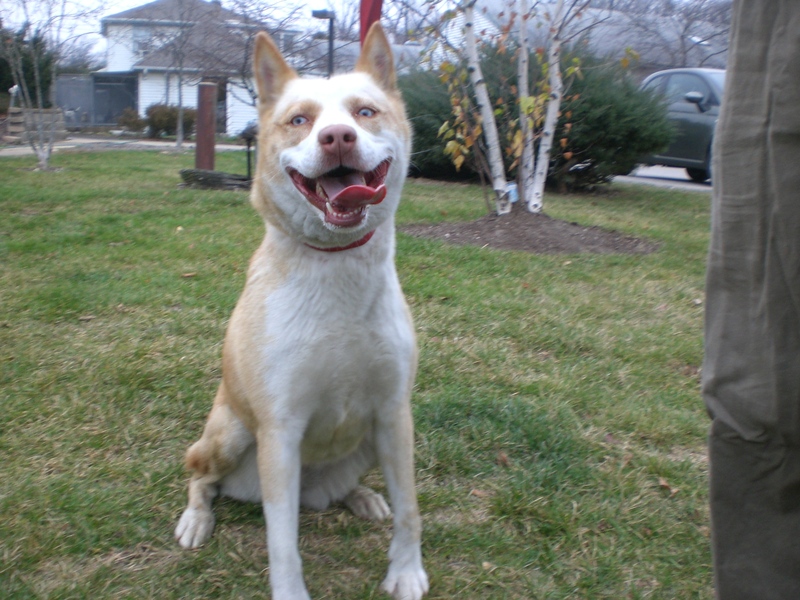 Petunia is a beautiful four-year-old Siberian Husky mix. 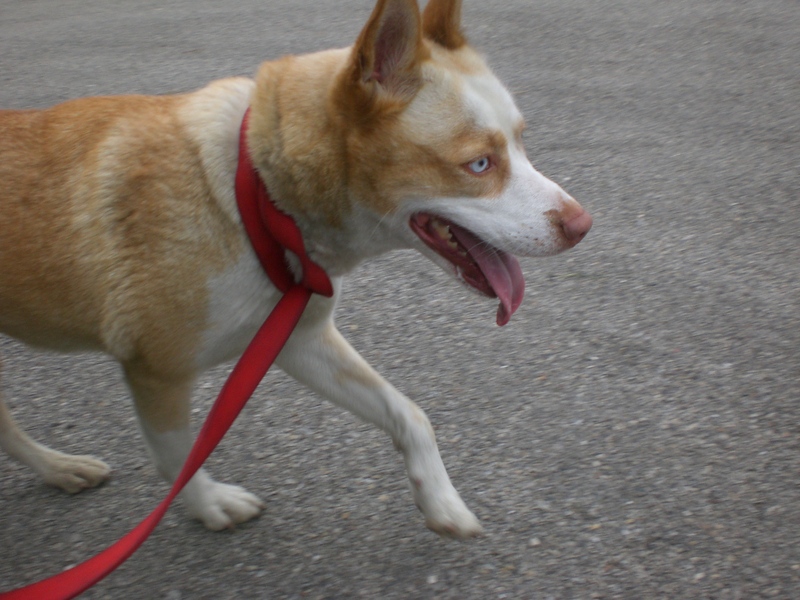 A lot of Huskies (like Akiva) are silver, and some (like Forest) are black, but Petunia is a unique brown color. To add to her look, she has striking blue eyes that everyone immediately falls in love with. When I took her for a walk, all of the decorating volunteers stopped what they were doing and showered her with attention because she’s just too pretty to ignore. 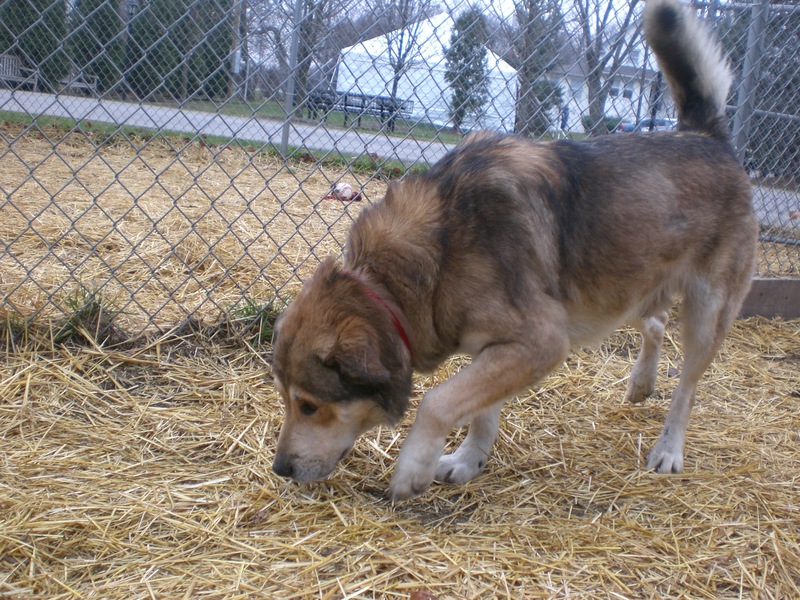 Petunia would do best in an active home, perhaps with a family who has experience with Huskies or other working breeds. 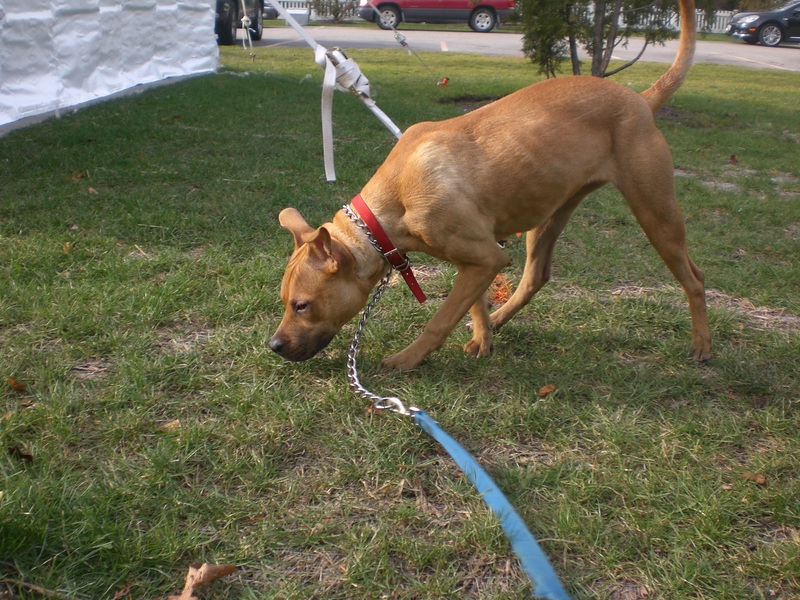 Petunia loves to run, run, run, as she was bred to do, and doesn’t want to be bored. Petunia would love to be your running partner, and would be sure to keep you motivated. Stop by the shelter to meet Petunia–you can’t miss her! Petunia is one dog who did sit and smile for me! 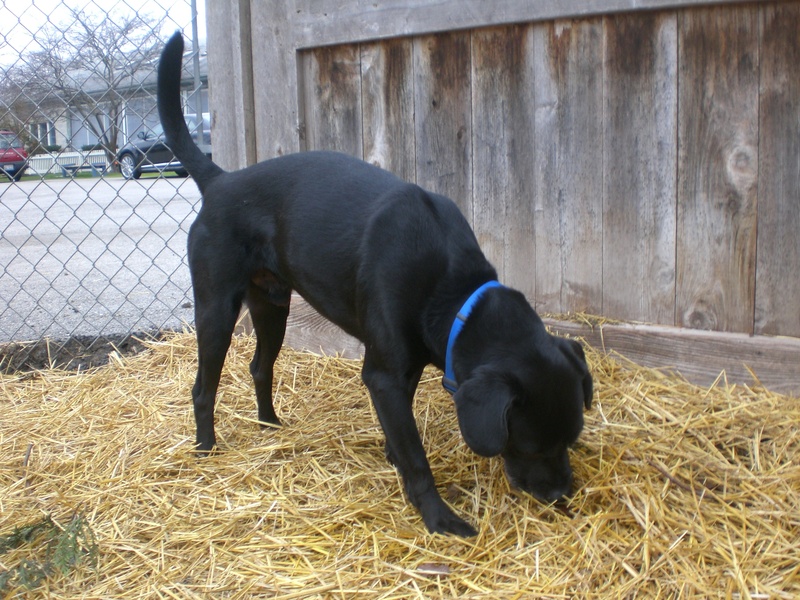 Black Jack the four-year-old Black Labrador Retriever mix is a sweet guy. He’s much smaller than the average Lab, but has the same happy-go-lucky personality and energy as any other Lab out there. He was so excited to go for a walk that he slipped right past Craig (but I caught him–good teamwork!). I took Black Jack (and his kennelmate Jane, below) to one of the runs, and Black Jack was romping and sniffing everywhere. He’s also a playful guy, and tried to get Jane to play with him a couple times. He’d go into a playbow, pop back up, run a few feet away, and then turn around as if to ask, “Why aren’t you coming with?” This happy dog is looking for a happy home. Is it with you? Jane the two-year-old Black Labrador Retriever (not to be confused with Jane the Hound) is Black Jack’s current kennelmate, and she is a real sweetheart. All she wants is a family to give her love and attention. She was a little calmer than Black Jack, but was still excited to explore the run when we first got there. After she finished exploring, Jane came and stood by me so I could pet her. The first couple times I tried to get a picture of her, she stuck her nose right in front of the camera–that would’ve been a little too much of a close-up! As I walked around the run, she would follow. She chose to stay by me rather than play with Black Jack, so you know that she will be a loyal pet. Max the three-year-old Shepherd mix is one of the more handsome dogs at the shelter, in my opinion. He has soft, floppy ears and always looks like he has a doggy grin on his face. One of the volunteers asked me to profile Max especially, because she thinks he’s such a great dog. He sure is! Max was pretty good at walking on the leash, but was ready to investigate as soon as we got to the run. With all that fluffy fur, he will be a great dog to cuddle with. 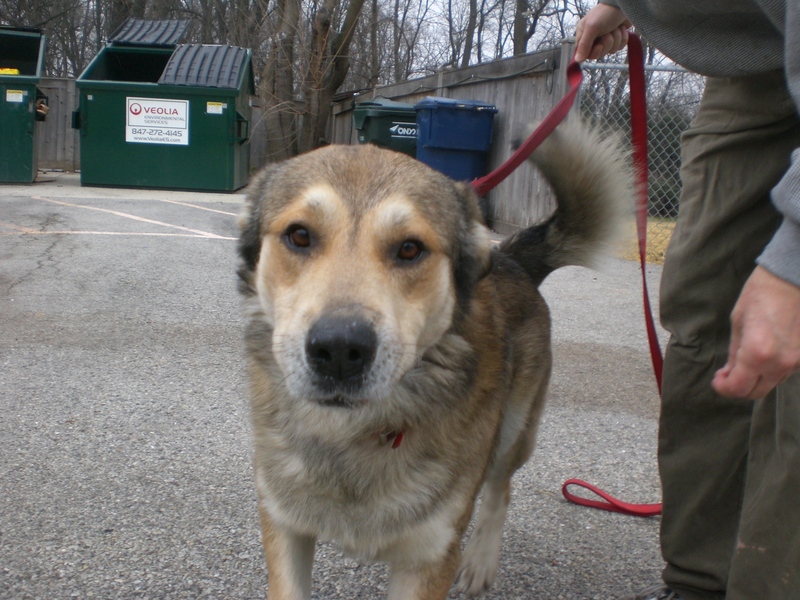 Since he’s a Shepherd mix, he’s a smart dog and will be happy to learn any new tricks you might want to teach him. 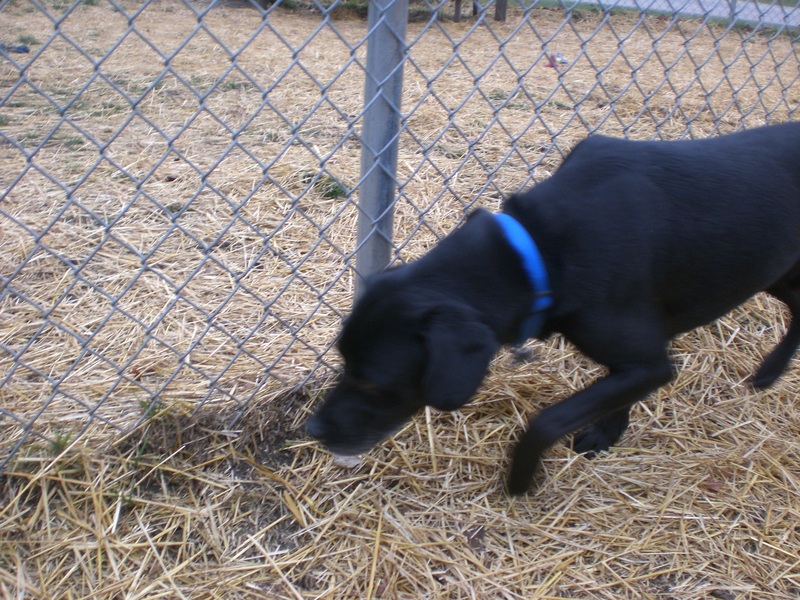 Max is waiting for you at the shelter, tail wagging! On this visit to Orphans of the Storm®, I also got to spend time with a few dogs I’ve previously written about. One of those dogs is extra-special: Peggy! 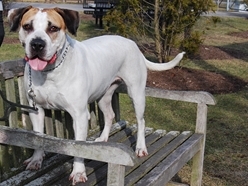 Peggy is a four-year-old Pit Bull Terrier mix and one of the dogs who benefited from The Tyler Fund. 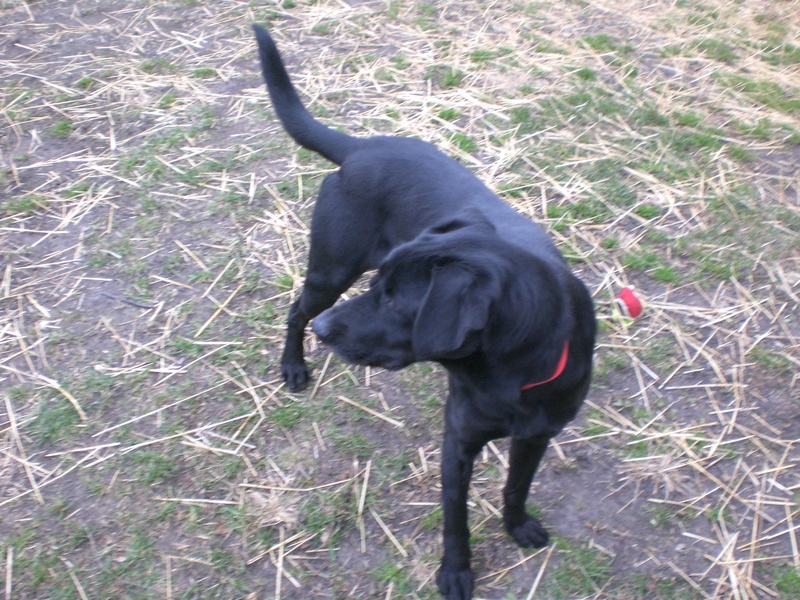 Peggy went off to training at Tops Kennels and graduated as a star student. The hope was that she would get adopted straight from Tops without having to return to the shelter, but unfortunately, here she is. She is a strong girl, but she is very willing to please and will only need a quick refresher to remind her of all the good manners and tricks she learned during her training. (She sat very nicely for me.) Peggy is also a giant lovebug. Every time I stop by her kennel, she licks my hands and then presses her side against the door so I can give her a nice scratch. Who doesn’t want a lovable, fully-trained dog to call their own? Peggy is hoping that Santa will bring her a family! This photo of Peggy is so nice because it was taken by Orphans’ actual photographer. I also said hello to Quiz the Terrier and Hershey the Chihuahua, who were out for some exercise with another volunteer. These two are some of my favorites. They are so sweet! I can’t even begin to understand why they’re still at the shelter. Smaller dogs are wonderful dogs, and these two are especially wonderful! Posted by Meet the Pooches on December 7, 2012 in Dog Profiles and tagged adoption, animal shelter, Chicago, dogs, Labrador Retriever, Orphans of the Storm, pets, Pit Bull Terrier, Shepherd, Siberian Husky.